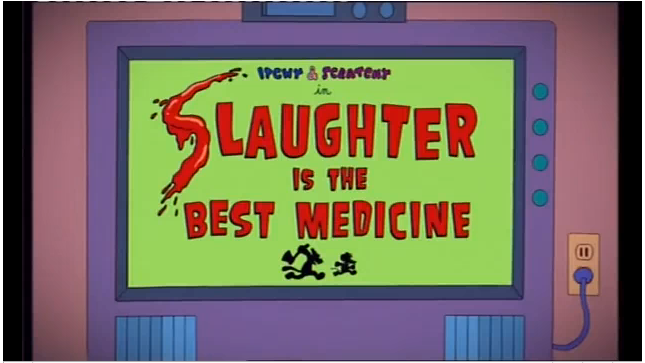 Slaughter is the Best Medicine is an advert and episode of Itchy & Scratchy that is also an ident for The Simpsons. It was created for the 20th anniversary of The Simpsons. This is an ident for Sky1 to tie in with The Simpsons 20th anniversary. It starts off with Homer picking up Santa's Little Helper and squeezing him to get the TV remote out. He then turns on the TV to find the Itchy & Scratchy episode "Slaughter is the Best Medicine". Scratchy is walking along the path when he sees a tile that says unsafe and one a couple of squares along that says safe. He steps onto the safe one to have Itchy throwing safes at him. Scratchy is taken to hospital where he sees a sign say A & E. As he gets closer, he sees it says Super Killing Laser. He is strapped to a table and a laser cuts a 1 out of it. Scratchy gets free and starts to run off as the now glass 1 shatters and slices into him, chopping him up. Modified on February 12, 2015, at 13:35.